The City of Tukwila is partnering with BNSF Railway to study alternative access routes to their intermodal yard in Allentown. Trucks currently access the facility via 42nd Avenue S and S 124th Street through the Allentown neighborhood. The City is building upon previous studies by examining the feasibility of the previously-identified existing route options, evaluating them given current conditions and broad screening criteria. This study is essential in helping the City seek future funding for design and construction from State and Federal sources. By partnering with BNSF, the City is building on these past studies and is now focusing on the financial and technical feasibility of the alternatives. The exploration of these alternatives is still in the early stages. The City will ensure its findings and any actions are communicated clearly to the community. This is the current route most trucks and vehicles use to access the facility. This will be considered the no-build or baseline alternative. 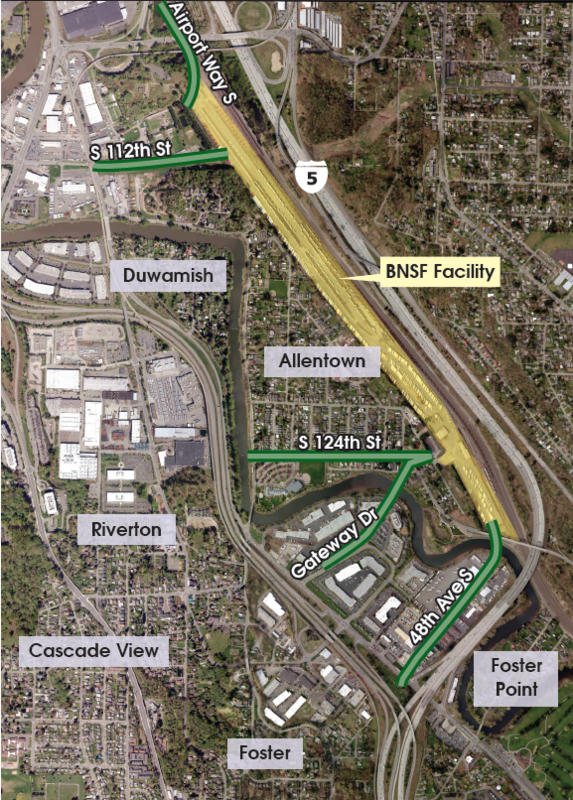 This proposal would connect with the existing gate through the north leg of Gateway Drive, a new roadway between the Boeing Employee Credit Union and ITT Technical Institute building, and a new bridge over the Duwamish River. 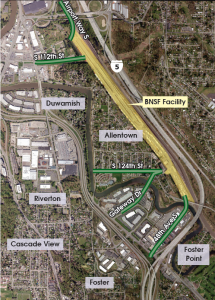 This alternative accesses the facility at the south end via the existing 48th Avenue S roadway and a new bridge over the Green River Trail and Duwamish River. This alternative accesses the facility at the northern half via a new roadway along the existing Seattle Public Utility and Seattle City Lights utilities corridor. This alternative accesses the facility at the north end via an existing railroad access road that goes under Boeing Access Road and Sound Transit Link Light rail line. Contact: Questions? Interested in learning more? Email us at AccessStudy@Tukwilawa.gov or call 206-431-2446.